I'd never even heard of it before, but it's happening as I write this. In all the fearsome Pennsylvania winters of my childhood, I never heard thunder or saw lightning during a blizzard…but we just had both a few minutes ago. Awesome. And such a heavy metal name, too. This is better than Hanukkah and Christmas and the Going Forth of Wadjet rolled into one. The following is posted here so as to spare myself the trouble of retyping it in lots of other places and I can just direct people here. Especially non-comics people who are trying to make sense of the contradictory and sometimes very foolish things being said on this topic. I'm far from an expert, so if you spot any mistakes please give a shout in the comments. Yes, a character whose nickname is "the White God" is being played by someone whose skin color is not what Westerners colloquially refer to as "white." Why, that's almost as unthinkable as a Hellene referring to the Furies as "the kind hearted ones" or someone calling a very large man "Shorty." Brown-skinned people were not unknown to the Vikings; they raided Iberia and encountered Moors. And funnily enough, Norse mythology itself features two races of gods -- the Aesir and the Vanir -- fighting and then joining forces. (Something like the Avengers/Defenders War.) There's a line in one poem that seems to say Heimdall was originally a member of the Vanir who crossed over to join the Aesir. 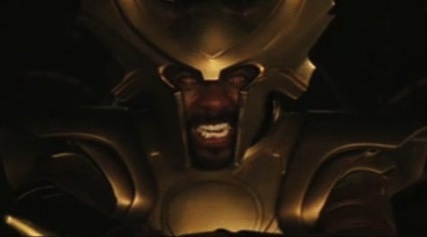 So the notion of Heimdall being a different race is not completely unheard of. In Marvel folklore, discrepancies between the depiction of gods in the pages of Thor and in standard Norse myth -- Marvel's Thor not having red hair, for instance -- were long ago rationalized by the explanation that the comics characters are not the Aesir and Vanir et al but their successors, reborn after the fall of Asgard at Ragnarok. Subsequent writers have probably fiddled with that explanation. (However, that thing some people are saying about "they're actually shapeshifting space aliens who took the form of Norse gods" is something else altogether and not considered to apply here.) The point is, historical considerations about what the Norse would have had in mind for Heimdall as noted above aren't strictly relevant. Thor comic co-creator Jack Kirby also created the first African superhero, the Black Panther. After that, he tried to make sure all his comic series were racially integrated. He even wrote and drew an African-American romance comic that was never published. 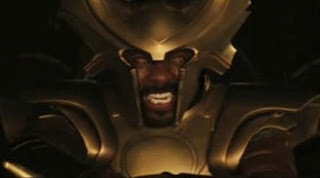 When he was working on Thor, I bet if you had asked him "Hey Jack, why aren't there any Black gods in Asgard?" he'd have told you "Sure there are!" and introduced one in the next issue. And most importantly, Jack Kirby nearly died fighting the Nazis…and if you ever told him that something in a movie made out of his Thor comics was going to cause irritation and annoyance to a bunch of ignorant bigoted white supremacist assholes, he would have been delighted. He would have said "Tell me what pissed them off and I'll do it twice as much!" I can't believe this is actually real, but apparently it is. I want one but I'm afraid of what might happen if my action figures evolve to become sentient tool-using creatures. And then one day the Monolith tells me "All these toys are yours, except the ones on the top shelf of the left bookcase. Attempt no landing there." No, the danger is just too great.